The ibis budget Arles Sud Fourchon (formerly Etap) hotel is located 1969 yds from the amphitheater and center of this town known as "Little Rome". Walk in Van Gogh's footsteps or explore the Camargue park 12.4 miles away and Saintes Maries de la Mer. The Alpilles park is a 15-30 minute drive away. Visit Les Baux de Provence, Fontvieille and St Rémy de Provence. Take a break at a great price in an economy hotel with air-conditioned rooms. Free WIFI and enclosed car park. Numerous stores are nearby. Monsieur C., Nous vous remercions pour vos commentaires suite à votre séjour à ibis budget Arles Sud Fourchon. C’est avec grand plaisir que nous recevons vos compliments. Aussi, nous ne manquerons pas de partager vos appréciations avec toute notre équipe. Votre satisfaction est la plus belle récompense pour notre personnel qui travaille jour après jour pour vous offrir un service irréprochable. Dans l’attente de vous accueillir de nouveau, nous vous prions de croire, Monsieur, en l’expression de nos sentiments les meilleurs. Toute l'équipe Ibis Budget ARLES Sud Fourchon. I had a generally good stay, friendly and helpful staff as expected. The room, however, was a bit below average when compared to ibis budget standards. Poor lighting, old style room, restroom was mustiness. 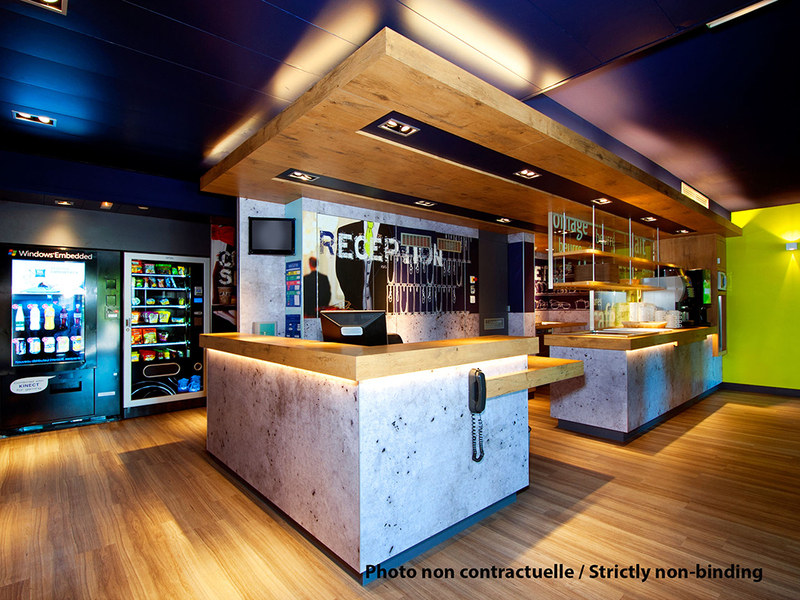 Monsieur S., Nous vous remercions pour vos commentaires suite à votre séjour à ibis budget Arles Sud Fourchon. C’est avec grand plaisir que nous recevons vos compliments. Aussi, nous ne manquerons pas de partager vos appréciations avec toute notre équipe. Votre satisfaction est la plus belle récompense pour notre personnel qui travaille jour après jour pour vous offrir un service irréprochable. Dans l’attente de vous accueillir de nouveau, nous vous prions de croire, Monsieur, en l’expression de nos sentiments les meilleurs. Toute l'équipe Ibis Budget ARLES Sud Fourchon. Booked, nut did not stay. Dear ROGER D., We very much appreciate your comments regarding your stay at the ibis budget Arles Sud Fourchon. It is always a pleasure to receive positive feedback. I will share your comments with our team. I am sure that this feedback will serve as an encouragement to all of our staff as we strive to continuously improve the quality of our services. Thank you again for sharing your experience, and we hope your next visit will be as pleasant as the previous one. Sincerely, Staff Ibis Budget ARLES Sud Fourchon. Lovely friendly staff with a much better breakfast than we anticipated. It takes about 20 minutes to walk into central Arles. There is another Ibis within about 200 metres - don't be fooled into taking the wrong exit from the roundabout! Dear ROGER J., We very much appreciate your comments regarding your stay at the ibis budget Arles Sud Fourchon. It is always a pleasure to receive positive feedback. I will share your comments with our team. I am sure that this feedback will serve as an encouragement to all of our staff as we strive to continuously improve the quality of our services. Thank you again for sharing your experience, and we hope your next visit will be as pleasant as the previous one. Sincerely, Team Ibis Budget ARLES Sud Fourchon. Esperienza sufficiente, stanze da Ibis budget. Dear MAURIZIO S., We very much appreciate your comments regarding your stay at the ibis budget Arles Sud Fourchon. It is always a pleasure to receive positive feedback. I will share your comments with our team. I am sure that this feedback will serve as an encouragement to all of our staff as we strive to continuously improve the quality of our services. Thank you again for sharing your experience, and we hope your next visit will be as pleasant as the previous one. Sincerely, Team Ibis Budget ARLES Sud Fourchon. One night stay that suited perfectly. Accommodation was very good for the price. Clean and we were given the option of a more suitable room when we arrived. Staff friendly and helpful and the breakfast was excellent in value and options. Dear AMBRE F., We very much appreciate your comments regarding your stay at the ibis budget Arles Sud Fourchon. It is always a pleasure to receive positive feedback. I will share your comments with our team. I am sure that this feedback will serve as an encouragement to all of our staff as we strive to continuously improve the quality of our services. Thank you again for sharing your experience, and we hope your next visit will be as pleasant as the previous one. Sincerely, Team Ibis Budget ARLES Sud Fourchon. Very comfortable, clean 2 night stay. Reception staff ver friendly and helpful. Rooms are small and no frills which is fine at such a price but of questionable cleanliness . Booked 2 nights but fled after first one as had no sleep due to light coming in from under door and through blind which is too small. Had some sort of allergic reaction to something in the room - hopefully cheap detergent and/or disinfectant and not something more sinister. After cancelling my second night with due cause I got a reply from the hotel telling me they cant refund me as my rate does not allow it and I should have gone down to reception at night and they would have sorted everything out....hardly likely. Dont stay here there are better hotels nearby for same budget and much better quality. I know I will not stay there again. We had 1 room but we booked 2. Extremely disappointing. There was a quarrel in the parking when we arrived and the reservation was for 2 romos but the hotel had only booked 1. OK, once I had managed to book! More than adequate budget price hotel. Booking was a nightmare, I was booking for 5 nights for myself and 2 friends. The online booking system just wouldn't accept the booking, had to phone at 10 p a minute, took over 40 minutes because the system would not accept bookings for more than €150 a time, so had to make 7, repeat 7 bookings with credit card details required every time and wit the details read back to me every time, including the full address of the hotel. Absolutely ridiculous! we only had one night and could find no fault at all. lovely staff and good place for parking. Positives: hair dryer available; kind people; large car park; diligent cleaners; quiet; Negatives: hard to find (no visible sign post at the roundabout directing you to it - which would be useful as there are 2 other Ibis hotels nearby). The toilet smelled badly; French-speaking TV channels only. Excellent in every way except for the air conditioning, which was insufficient that night. Otherwise, excellent value for the money. I know it is a budget hotel but found the bathroom out of date and the shower base was cracking. No bath mat to stand on once out of shower floor slippery. The towels were small and old. The shower curtin needed replacing as dirty on the bottom. The staff were very helpful.